Comments Off on Who Stole My Belly? The Belly Bandit Did It!! You’ve gone through the 10 months of pregnancy…and as you’re looking forward to the amazing blessing that has been placed in your life (and not being preggo anymore)…another concern is always, how do I get that belly down so I don’t still look pregnant AFTER delivery? I have met so many moms that have been approached postpartum being asked how far along they are. Although the belly is natural after delivery, it doesn’t have to last very long. This band is seriously amazing. If you take a look at many before and after pictures, they are simply amazing. Now, its not a fat burning band…so if your body deposited fat on your belly (or you were really eating anything when you were preggo) it’s not going to “remove the fat”. That’s not what it’s made for. The belly bandit is a compression wrap. What the heck does that mean? It encourages everything in your belly area to go back to what it used to be pre-pregnancy. So, it encourages the uterus, hips, ribs (for me), and even helps to squeeze out any excess fluid that has accumulated in the belly area…which is pretty much the majority of what is there postpartum anyways, right? I put on the belly wrap 5 days postpartum (you can see this on the left side of what I looked like before belly bandit). I’m not sure why I waited 5 days…I think I was so focused on getting the nursing down, that I didn’t focus on anything else. Some people put it on immediately after delivery…I plan to do this next time. But I still reaped the benefits of the wrap. 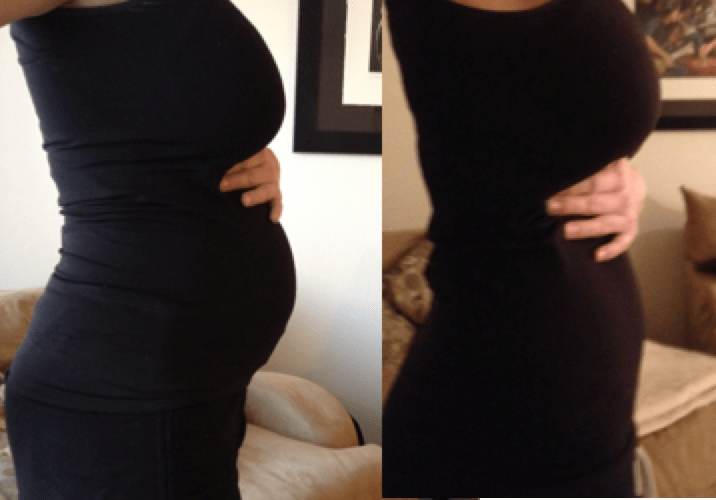 Literally within a couple of days of wearing the wrap, my belly began to shrink…and I noticed that the extra fluid that was in the area seemed to be draining rather quickly. This wrap was encouraging my body to squeeze all that extra fluid out! (yay!). Within a week my belly was flatter and pretty much mimicked the picture you see on the right hand side (which was taken 3 weeks postpartum – which means it was a little over two weeks after I started wearing the wrap). Take a look at my images and not only the belly shrank, but look at the circumference of my ribs as well…that shrank too (take a look at the tips of my fingers). I have to say that I’m really impressed with the results. I was getting compliments up and down “you just had a baby? WOW”. And that’s always nice to hear, right? Belly Bandit has a few different wraps to fit your style and body type. I chose the couture one and the bamboo one. I wore the couture one during the day (to look/feel a little stylish) and the bamboo one at night for a breathable wrap. I found that I really needed to have two wraps…especially since baby was spitting up/throwing up on me, which leaked down to them and also, when it comes time to washing them, you really don’t want to be without one. It helps to have two so you can alternate. The wraps have to be hand washed cold, and then laid flat to dry. So you can see why two can really help out, especially in those first few weeks when your hormones are getting back to normal and you’re sweating a little more than usual. I was not compensated for this review. Instead I was provided these products for my social media services.